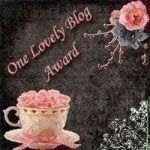 I'd like to thank Lori at Some of My Favorite Books for bestowing this award for my blog. I've recently started visiting her blog and really enjoy it! I love the background design. Accept the award, post it on your blog together with the name of the person who has granted the award, and his or her blog link. Pass the award to 15 other blogs that you’ve newly discovered. Remember to contact the bloggers to let them know they have been chosen for this award. Ok, so that's not 15, but those are the ones I've been introduced to in the last couple of weeks. I found some other sites, but they weren't blogs. Visit the above blogs, especially Lori's, and enjoy your time at each one! Thank you for the honor :) And your blog looks fabulous, by the way! Congrats and thank you so much for the lovely award!